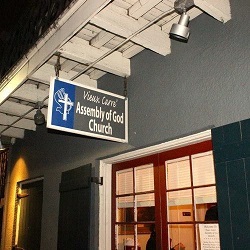 Vieux Carre Assembly of God is in the Heart of the French Quarter of New Orleans, just a block from Bourbon Street. This is the meeting place for a street ministry outreach team. Bourbon Street is known for its heavy drinking and other wild living. Young runaway girls have wandered here and, sadly, been caught up into prostitution. Various tourists come here and is quite active in the daytime and even when it is not Mardi Gras. Indecent drunken disorderliness appears to be common place there. In 2012, I was in this city for a conference and got to tour around a bit. When I first walked down Bourbon Street, I did notice how much prostitution there was which I was not aware of before I went there. Desite my intent to avoid going down this street again, the next day the Lord told me to go there. I went but carefully walked down the middle of the street to avoid any solicitation of the prostitutes. I was happy to find there was an evangelism team as I walked further down. This street evangelism team meets at their church as their base to step out to do ministry outreach sharing the good news of Jesus while holding a cross. By use of gospel tracts, megaphone, conversation and prayer these Spirit-filled Christians do effective outreach right at the key most location in New Orleans. I was invited by their ministry team leader and welcomed by the team to join in an ad-hoc manner for the day. Committed believers in Jesus know how to recognize others in the Lord in the body of Christ. Being welcomed readily as such by believers shows the characteristics of true Maverick Christians. Fortunately, I had my tracts in hand ready for what opportunities the Lord would lead me to. Paul Gros is pastor of the local church. Members of the ministry team expressed their devotion to the Lord and their love for the Lord Jesus, their love for the universal body of Christ, and for the lost. They are out on the street many days sharing the word. Then saith he unto his disciples, The harvest truly is plenteous, but the labourers are few; Pray ye therefore the Lord of the harvest, that he will send forth labourers into his harvest. If you are a committed believer in Jesus, coming to visit the area of New Orleans, and have a burden for the lost, the poor, and the broken, I encourage you to contact these ministries. They are worthy of support. Police in New Orleans have put a stop to evening preaching on Bourbon Street in New Orleans. Bible-believing evangelical preachers from Raven Ministries have been arrested for preaching after sunset. Christian friends, please pray for your brothers and sisters in these street ministries mentioned here and for the gospel to continue to go forth during evenings on Bourbon Street. 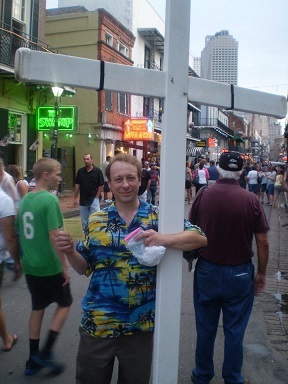 The New Orleans Bourbon Street preaching after dark ban was removed. This did not stop the lawsuit brought upon a street preacher who was arrested for doing so. I praise God for the blessed opportunity to share the gospel again together with the Vieux Carre A/G team this evening.